German Chancellor has condemned the anti-Islamic protests, saying its leaders have “prejudice, coldness and hatred in their hearts” and called on people not to follow them. However, one in eight Germans say they would join such rallies, a poll showed. 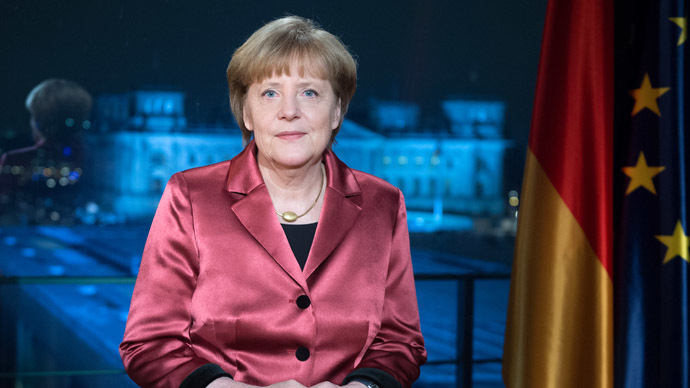 Angela Merkel has accused leaders of Pegida anti-Islamic movement, which is gaining popularity in Germany, of hijacking the slogan of 1989 Berlin Wall demonstrations, “Wir sind das Volk” (“We are the people”) for their xenophobic purposes. “Today many people are again shouting on Mondays: 'We are the people’. But what they really mean is: you are not one of us, because of your skin color or your religion,” Merkel said in her New Year’s address. A right-wing populist movement, the so-called “Patriotic Europeans Against the Islamisation of the Occident”, or Pegida has been staging weekly rallies since late October, the month when it was formed. With affiliates across Germany - in Dresden, Bonn, Dusseldorf, Kassel, Wurzburg - Pegida protests gathered many supporters. “Worldwide there are more refugees than we have seen since the Second World War. Many literally escaped death. It goes without saying that we help them and take in people who seek refuge with us,” Merkel said, condemning any biased attitude towards the coming immigrants. German chancellor has urged people not to follow protest leaders. “I say to all those who go to such demonstrations: do not follow those who have called the rallies because all too often they have prejudice, coldness, even hatred in their hearts,” she said. Pegida’s first protest was only attended by a couple of hundreds. However, by December a number of its supporters grew with it so far biggest rally attended by 17,000 people. The movement’s Facebook page has almost 100,000 subscribers. The supporters demand strict immigration controls, obligatory“integration”for foreigners and“criminal asylum seekers”to be sent home. “We want to reclaim our own country,” one banner at a recent Dresden protest read, as reported by The Independent. “Beware Ali Baba and his 400 drug dealers,” another stated. The Pegida leader is 41-year-old Lutz Bachmann, who used to sell sausages at a Christmas market, and was earlier convicted of several offenses. He currently manages an advertising agency. At the same time, the anti-Pegida movement is also growing in Germany - a recent petition against the group has been signed by over 250,000 people. The next anti-Islamic protest lead by Pegida is planned for January 5 in Dresden. Despite Merkel’s appeal, one in eight Germans would join an anti-Muslim march if Pegida organized a protest in their home towns, according to a recent opinion poll by Forsa polling institute for Germany's Stern magazine published on Thursday. The survey that involved over 1,000 people showed that 13 percent would attend an anti-Muslim march nearby and 29 percent of people said anti-Islamic marches were justified given the influence that Islam has on life in Germany. Two thirds of those polled believed the idea of an “Islamisation” of Germany was an exaggeration, but many Germans are concerned about the numbers of asylum seekers. Merkel's ex-interior minister, the Bavarian conservative politician Hans-Peter Friedrich, said she has been ignoring conservative issues which led to such radical right-wing movements as Pegida or Eurosceptic Alternative for Germany (AfD).